The Advisory and Appeals Board consists of five members appointed by the City Council to serve three-year staggered terms. The Board considers matters pertaining to the Building, Electrical, Mechanical, and Plumbing Codes and determines the suitability of materials or methods of construction and provides reasonable interpretations of the provisions of the codes. 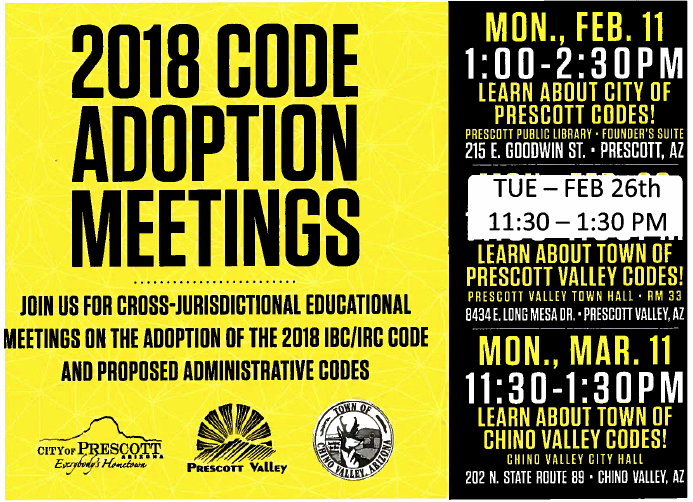 The City of Prescott, the YCCA, the towns of Chino Valley, Prescott Valley, and Yavapai County will be hosting meetings to review 2018 Code Adoption. Learn about Prescott City codes on Monday, February 11 at 1 p.m. at the Prescott Public Library, located at 215 E. Goodwin Street. Learn about Prescott Valley codes on Tuesday, February 26th at 11:30 a.m. at Prescott Valley Town Hall, 8434 East Long Mesa Drive. The Chino Valley meeting will take Place Monday, March 11 at 11:30 a.m. at Chino Valley Town Hall, 202 N. State Route 89. For more information, contact the City of Prescott, or the town that you are interested in attending.